Who's Doug Hitchcock? And in a world full of goal-setting exercises, why does Doug's system stand out? Find out why most goal-setting goes hopelessly off the mark and Doug's plan works almost like magic year after year. Find out how we've made almost impossible dreams come true with this goal-setting system. 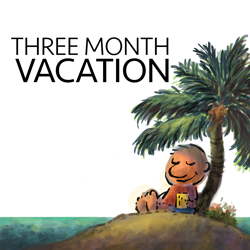 This is the Three-Month Vacation. I'm Sean D'Souza. Doug Hitchcock was my first real mentor and he had been bankrupt thrice. When I first moved to Auckland in the year 2000, I didn't really know anyone. I was starting up a new business, I was starting up a new life. I joined a networking group and within that networking group I asked for a mentor. Well, no one in the networking group was willing to be a mentor, but someone did put me in touch with Doug. The only problem with Doug was he had been bankrupt thrice. Now, when I say he was bankrupt thrice, it doesn't mean he was still bankrupt. He just pulled himself out of the hole three times in his life and there he was, at about 70 plus, and he was my first mentor. That's how I started doing goal setting, all the way back in the year 2000. Almost immediately, I got all the goal setting wrong. You ask, how can you get goal setting wrong? After all, you're just putting goals down on a sheet of paper. How can you get something like that wrong? You can't write the wrong goals, but you can write too many goals. That's exactly what I did. I sat down with that sheet of paper and I wrote down all my work goals, my personal goals, and I had an enormous list. That's when Doug came back into the scene, and he said, “Pick three.” I said, “I could pick five.” He goes, “No, no, no. Pick three.” I picked three goals in my work and three goals from my personal life. You know what? By the end of the year, I'd achieved those goals. Ever since, I have been sitting down and working out these goals based on Doug's method. Doug may have lost his business thrice in a row, but he knew what he was talking about. Most of us just wander through life expecting things to happen. When they happen, we say they happen for a reason, but they don't happen for a reason. They happen, and we assign a reason to it. In this episode, I'm going to cover three topics. The first is the three part planning. Then we'll go the other way. We're create a stop doing list. Finally, we'll look at benchmarks and see how we've done in the year. Let's start off with the first one, which is the three part planning. Does the San Fernando earthquake ring any bells in your memory? Most people haven't ever heard of this earthquake, and yet it was one of the deadliest earthquakes in US history. It collapsed entire hospitals, it killed 64 people, it injured over two and a half thousand. When the damage was assessed, it had cost millions of dollars, and yet it could have been the disaster that eclipsed all other US disasters. That's because the earthquake almost caused the entire Van Norman Reservoir to collapse. The dam held, and yet, if it had collapsed, the resulting rush of water would have taken the lives of more people than the Pearl Harbor Attack, the 1906 San Francisco Earthquake, 9/11 and 1900 Galveston Hurricane combined. In barely 12 seconds, the top section of the dam had disintegrated and yet, the surrounding areas were extremely lucky. The reservoir was only half full that day. The aftershocks of the earthquake continued to cause parts of the dam to break apart. A few feet of free board was the only thing that stopped a total collapse. This total collapse is what many of us come close to experiencing as we try to clamber up the ladder of success. We try to do too many things and we don't seem to go anywhere. In effect, this is like water cascading down a dam. There's too many things and we have no control over it. What's going to stop it? The only thing that seems to stop anything is some kind of focus and goal setting is focus. The way we go about our goal setting is the way Doug showed me. The first category of goal setting is what we want to achieve at work. The second set comprises of our personal goals. The third, this is the most critical of all, what we're going to learn. Should we start off with the first one, which is our work goals? Well, that's not the way we do it as Psychotactics. The way we work at Psychotactics is we look at our personal goals. Our own lives are far more important than work. What we do is we sit down, and first, we plan vacations. As you know, we take three months off. We've been doing this since 2004. We started our business at the end of 2002. Yet by 2004, we had decided we were going to take three months off. The thing is that your vacations also need planning. Our vacations are broken up into big breaks, small breaks, and weekends. Now the big breaks are the month long vacations, and then the small breaks are in between that. We're go away for a couple of days somewhere, and that's our small break. I'm saying weekends, because before I wouldn't take weekends off. I'd be working on the weekend at least for a few hours on Saturday morning and a few hours on Sunday morning, and I don't do that any more. Now that's almost written in stone. It's very hard for me to get to work on weekends. I'll slide sometimes, but it's very hard. That's how you start off with personal goals. You plan your breaks. You plan what you want to do personally. Once you're done with that, then you go to your work goals. We have a lot of work goals, we have the article writing workshop coming up, we've got the 50 words workshop, which is, how do you start up an article. We've got a whole bunch of things, because we've got products, we've got courses, we've got workshops. All of this has to sit nicely between, so that we work for 12 weeks and then we go on a break. We've decided that we're not having any workshops next year. We've had a lot of workshops this year, no workshops next year. Now, this leaves us the chance to focus on the courses and the products. Now my brain is like that dam, there's always water rushing over. I want to do a million projects, but then I have to choose. The article writing course is one of the things that I want to do for sure. I want to do a version 2.0 of it. The cartoon bank, I've been putting that off for a long time. That's definitely something I want to do. Then I'll pick a third one. Do I stop at three? No, but I make sure that I get these three down. The three that I'm going to do, they go down on paper. Some other projects will come up, a lot of stuff that I might not expect, and yet I'll get all of this done, but these three, they'll get done. Those three vacations, they will get done. Then we get to the third part, which is learning. What am I going to learn this next year? Maybe I'll learn a software, or maybe I'll learn how to use audio better. The point is, I have to write it down, because once I write it down, then I'm going to figure out where I have to go and what I have to do to make sure that learning happens. This is not just learning like reading some books or doing something minor like that. This is big chunks of learning, so that by the the end of the year, I know I've reached that point. When it comes to planning, the first thing that we're always doing is we're looking at these three elements, which is work, vacation, and learning. If we have to do other sub projects, we'll do it, but these nine things get done. Year after year after year. This is what Doug taught me, he gave me this ability to focus. I consider myself to be unfocused, I consider myself to want to do everything and anything. That was the gift of Doug. In the year 2008, we had a program, it was a year long program. You probably heard of it. It was called a Psychotactics Protégé program. We would teach clients how to write articles, how to create info products, public relations. Lots of things along the way in that year. As you'd expect, it was reasonably profitable. 15 students paid $10,000, and so that was $150,000 that we would have in the bank before the year started. In 2009, we pulled the plug on the Protégé system. Why would we do that? We started it in 2006, it was full, in 2007 it was full, in 2008 it was full, in 2009 there was a waiting list. We decided not to go ahead with it. We decided it was going to go on our stop doing list. We were going to walk away from $150,000, just like that. Yes, some clients were unhappy, because they wanted to be on the next Protégé program. They had seen the testimonials, they had seen the results. They knew that it was good enough to sign up for. They knew that $10,000 was a very small investment, for a year long advancement. On our part, we realized that we had to walk away from $150,000 that we were getting on cue, every December. This is what's called a stop doing list. We've used this stop doing list in our own lives. When we left India, and got to Auckland, it wasn't like we were leaving something desperate. We were leaving something that was really good. I was drawing tattoos all day, going bowling in the afternoon, having long lunches, Renuka's company was doing really well. They were picking up all expenses, and the only thing we really had to pay for was food but, at that point in time, we decided we had to make a break. We had to stop doing something so that we could do something different. We don't know whether that different is better, but at that point we have to stop it, so that we can explore what is coming up ahead. There are two things that you put on your stop doing list. One, something that is working exceedingly well. The second thing, something that's doing really badly. Or something that's getting in your way. Now, the first one doesn't make any sense. If something is doing exceedingly well, why would you stop it? Well, the point is that if you continue to do something, then you can't do something else. You don't know how good that something is until you stop doing it and then you go on to do something else. Last night, I was reading The New Yorker, and The New Yorker is one of my favorite magazines. There's James Surowiecki saying exactly the same thing. He's saying that Time Warner should sell HBO. HBO has now 120 million subscribers globally. It has earned over 2 billion dollars in profits last year. It's stand alone streaming service has got over a million new subscribers since last spring. What does the article recommend? It recommends that they get rid of it, they sell it, they get the best price for it at this point of time, when they're doing so well. What if it doubles in its value? That's the answer we'll never know, but the article went on. It talked about ESPN and how in 2014 it was worth 50 billion dollars. Disney owned it, they should have sold it, they could have banked the money. They could have focused on something else, but no, they kept it. ESPN is still doing well, it's still the dominant player, but you can see that it's not exactly where it was in 2014. The Protégé program was doing really well for us, clients were with us for the whole year. They would then join 5000 BC, we'd get to meet them. It was a lot of fun, and it generated a sizable revenue and we walked away from it. It enabled us to do other stuff that we would not have been able to do. When you say stop doing list, it's not just the bad stuff that you have to stop doing. Sometimes you have to stop doing the things that are very critical, like next year we're not doing workshops. Workshops are very critical to our business, but we're not going to do the workshops. Instead, we'll do online courses. Instead, we'll do something else. We'll create that space for ourselves, even though the workshops are doing really well. The other side of the stop doing list is stuff that's driving you crazy. You know it's driving you crazy, but you're not stopping it. For instance, in September of this year, we started rebuilding the Psychotactic site. Now, there are dozens of pages on the Psychotactic site and I want to fiddle around with every single one of them, and do things that are interesting, different. The problem is that there are other projects, like for instance the storytelling workshop. Of course, vacations that get in the way. The point is that, at some point, you have to say, okay, I really want to do this, but I'm not going to do this. I'm going to put it off until later. This is procrastination, but it is part of a stop doing list. You can't do everything in the same time. Last year, this time, we had the same dilemma when we were going to do the podcasts. I wanted to write some books for Amazon, and I wanted to do the podcast. Every day, we would go for a walk, and it would run me crazy. I didn't know where to start, when to start, what to do first. I had to sit down and go, okay, what am I going to stop? I just dumped the Amazon books and started on the podcast. Now we're on podcast number 70, and it's not even been 52 weeks. It shows you how that stop doing list can help you focus and get stuff out of the way. Sometimes you have to procrastinate to get that point. Now the stop doing list is not restricted to work alone. You can take it into your personal life as well. For instance, I used to get my hair cut by a hairdresser, and I was dissatisfied for a very long time. You come back in, you grumble, and my wife, Renuka, she said, “Okay, stop grumbling. Go and find another hairdresser.” I ran into Shay, now Shay was cutting my hair so well, it was amazing. I wasn't the only one who thought that was amazing. Usually, I was on a waiting list at a barber shop. I would get there, and there were two people in front of me, waiting for Shay. While a few of the barbers just stood around, doing absolutely nothing because no one was interested. Then, one day, involuntarily, Shay went onto my stop doing list. Kimmy was around and Shay wasn't and so Kimmy cut my hair. She was better than Shay. I thought, “Oh my goodness. I should have done this a long time ago.” Then Kimmy got transferred to another branch, and now there's Francis. You've heard about Francis in other podcasts. Now Francis is my top guy. There you go, even in something as mundane as cutting hair, there is a stop doing list. You have to push yourself a bit, and at other times you have to pull back and go, “No, we're not going to do that.” The stop doing list is for good times, as well as for pressurized times. You have to decide, I'm going to stop doing it, I'm going to move onto the next thing. This takes us to the third part of planning, which is benchmarks. Now what are benchmarks? Often when we set out to do a project, say we're going to do that website. What we don't do is we don't write down all the elements that are involved in doing that website because a website can go on forever, can't it? It expands exponentially. When you are saying, I am going to write books for Amazon. Well, how many books are you going to write? How many pages are the books going to be? What's the time frame? Where are you going to get the cartoons from? Who's going to do all the layout? Having this kind of benchmark in mind makes a big difference. When we plan for something, for instance if I'm planning for the article writing course, which is version 2.0. I'm going to have to sit down and work out what I'm going to have to do. When I'm doing the stock cartoons, I'm going to have to sit down and work out what kind of stock cartoons, how many. It's perfectly fine to write a top level goal. You should do that, you should say, “Okay, I'm going to do the website,” but then you have to get granular. The granular bit tells you, have I reached my destination. Otherwise, people don't get to their goals, and that's why they're struggling, because there's no clarity. Usually, you're going to get the clarity when you have only three things to do, but even so, if you don't have benchmarks you'll never know when you're reaching your goal or if you're going to reach your goal. What did we cover? We looked at three sets of goal setting, and that is your personal goal setting, your work goal setting, and your learning goal setting. Instead of having 700 of them, you just have three things that you want to achieve in the year. Three major things that you want to achieve in the year. Logically, you start with the work, but don't handle the work. Just go to the breaks. Organize your breaks first, because you get reinvigorated and you come back and then you can do better work. First, fix the breaks and then go to the work, then go the learning. That takes care of the first set. The second thing that you want to do is you want to make sure that you have a stop doing list. Sometimes, things are working, they're going your way, and they still have to be dropped. That's what we did with the Protégé program, that's what we did with our move to New Zealand, and a lot of good things have become better, because we've decided to move along. Sometimes, you're just confused because you have too many things to do, and procrastinate. Go ahead. I mean, I know this about planning, not procrastination, but procrastination is a form of planning, when you have too much to do. Finally, have the benchmarks. Make your goals a little more detailed so that you know when you're hitting those benchmarks. Plan it in a little more detail. That's how you'll reach your goal. This is what goal setting is about. It's very simple. People make it more complicated than it needs to be. Very simple. Work, vacation, and learning. Get your paper out, get your pen, and start writing. Three goals. You can start off with seven, or ten, but whittle it down to three. Oh, and make sure you write it down. When you write it down, things happen. It's like magic when you write it down. Keep it in your head, it's not as powerful. Write it down, it happens. If one of your goals is to join 5000 BC this year. That's 5000 BC, our membership site. You'll find that it's quite a nice place to be. It's a very warm and friendly place. It would be great to see you there. It also gives you the opportunity to be first in line for any of the online courses that we're having. That might not seem like a big deal until you see how cool the online courses are at Psychotactics. It's not just another information dump, you actually get the skill. If you set out to be a cartoonist, you become a cartoonist. If you set out to be a writer, you become a writer. It's not just information that you're getting, it's all very practical. Being a member of 5000 BC gives you that little edge to get in there before everybody else. You have to read The Brain Audit, however. You can get that at psychotactics.com/brainaudit or on amazon. Com. If you've read The Brain Audit and you would like a special collector's edition, then email us at Psychoanalytical. We'll give you instruction on how to get the special collector's edition. That's it from me at Psychotactics and the Three Month Vacation. Bye for now. One of the biggest reasons why we struggle with our learning is because we run into resistance.